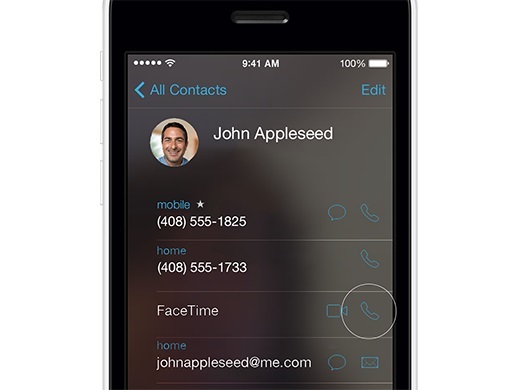 Facetime service has evolved a lot ever since it was first announced by Steve Jobs back in 2010. The feature was added to the Mac and later gained audio calling capabilities. Now it seems like Apple has added another major feature to the popular Internet based calling service allowing users to make group audio calls with their iOS and Mac friends. As reported by 9to5Mac the feature has been discovered by users in iOS 8, who have been running the first beta on their device. The website did not mention any specific details about the feature such as how many users can be added to a call at a time and whether the same feature is part of OS X Yosemite or not. Addition of group audio calls to Facetime Audio is a big news and will allow the service to compete with services such as Skype, which also offers this service and in which you have to use the desktop app in order to add people to a call. No signs of group Facetime video calls have been discovered yet but we believe that if group audio calls have been added then that would be the next logical step. Despite all the new features the breakthrough that Facetime needs is availability on non-Apple platforms that includes Windows and Android. Only then it will truly be able to compete with major communication services.